3M™ Half Mask & Full Face Respirators Provide Protection Against Inhalation Of Hazardous Materials In Laboratories, Pharmaceutical, Chemical and Manufacturing Facilities. 3M Face Mask Cartridge Respirators are made of silicone or thermoplastic elastomer material for long lasting durability and dependability. 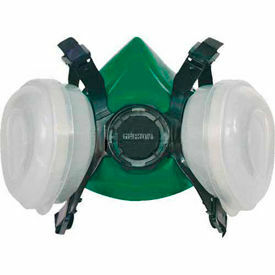 Respirators protect users against various organic vapors and gases. Available styles are Full and Half Facepiece Respirators Sizes are Small, Medium, and Large. Note: Cartridges and filters are sold separately and must be selected in accordance with the recommendations of OSHA, NIOSH and the manufacturer. 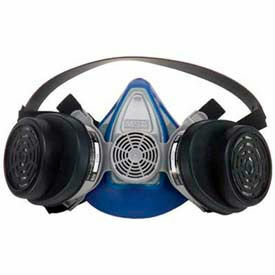 MSA Half Mask & Full Face Respirators Are Used For Construction Sites, Workshops And Paint Shops. MSA Safety Works® Respirators are made of heavy duty plastic for long lasting durability. Ergonomic design is lightweight for greater comfort and support. Molded nose area ensures tight fit for added safety. 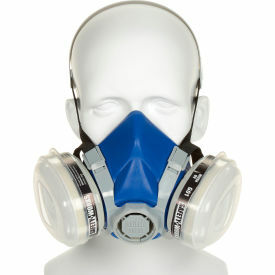 Available types include Half Facepiece Respirator and Full Facepiece Respirator. Color is Blue or Black/Blue. Size is Medium. Package quantity is 1. Approved by NIOSH under the NIOSH 42 CFR 84 respirator certification regulations. Multi-Purpose Respirators are approved for use with ammonia, organic vapors, chlorine, hydrogen chloride, chlorine dioxide, sulfur dioxide, hydrogen sulfide(for escape only), formaldehyde, hydrogen fluoride and methylamine gases. Activated carbon cartridges and large surface area pre-filters for optimal filtering capability. Available colors are Black/Blue and Blue. North By Honeywell® Half Mask & Full Face Respirators are used in Automotive, Industrial, Manufacturing industries and more. North by Honeywell® facepiece cartridge respirators prevent particulate access and improve air quality for sanding, painting, and more. Contoured sealing flange and cradle suspension system seal evenly on face, eliminating pressure point discomfort. Lightweight design ensures worker acceptance and added comfort. Filters and cartridges sold separately. Several styles available. Dimensions vary per model. 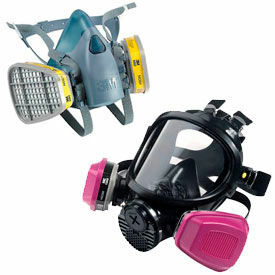 Gerson® Half Mask & Full Face Respirators Are Used For Applications Including Automotive, Maintenance, Safety, And More. Gerson® face mask cartridge respirators are made of high quality materials for long lasting durability and dependability. Respirators prevent contaminant access and improve air quality for sanding, painting, and more. Low profile, swept-back cartridges enhance field of vision. Includes lightweight, non-allergenic face-piece for protection. Features cradle suspension and adjustable head straps. 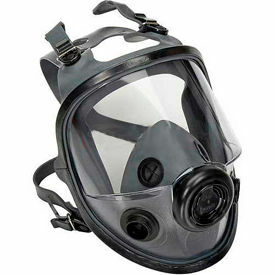 Types are Filter and Half Facepiece Respirator. Package quantities are 1 and 2. NIOSH approved. Dimensions vary per model. 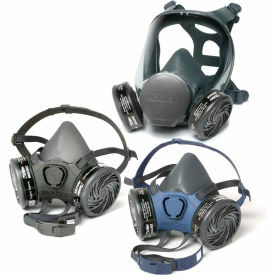 Moldex® Half Mask & Full Face Respirators Are Used For Applications Including Automotive, Maintenance, Safety, And More. Moldex® facepiece cartridge respirators are made of high quality materials for long lasting durability and dependability. Respirators prevent particulate access and improve air quality for sanding, painting, and more. 100% PVC-free. Sizes are Small, Medium and Large. NIOSH approved. Flexible facepiece material provides an excellent face-to-respirator seal which improves fit and comfort. Respirators protect user against harmful vapors. Hygiene cover helps keep dirt out of mask when not in use and helps keep shape of seal intact.